This is an artist's interpretation of the area surrounding the Huygens landing site, based on images and data returned Jan. 14, 2005. 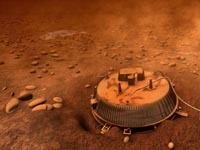 On this day, the European Space Agency's Huygens probe reached the upper layer of Titan's atmosphere and landed on the surface after a parachute descent of 2 hours and 28 minutes. The Huygens probe was delivered to Saturn's moon Titan by the Cassini spacecraft, which is managed by NASA's Jet Propulsion Laboratory, Pasadena, Calif. NASA supplied two instruments on the probe: the descent imager/spectral radiometer and the gas chromatograph mass spectrometer.